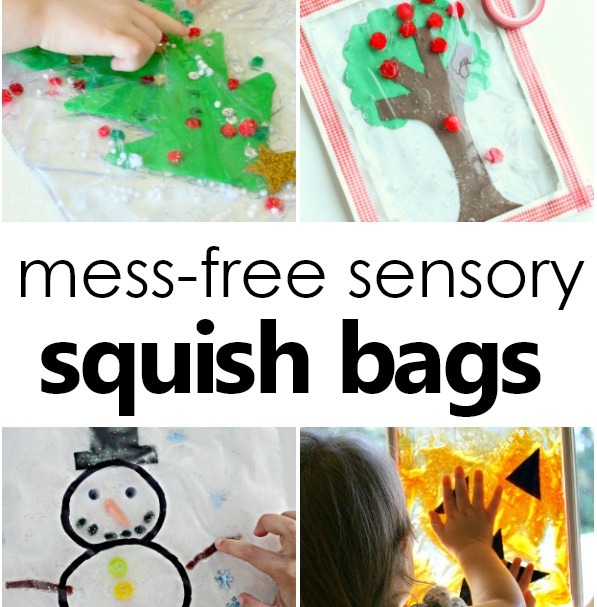 We love sensory squish bags! 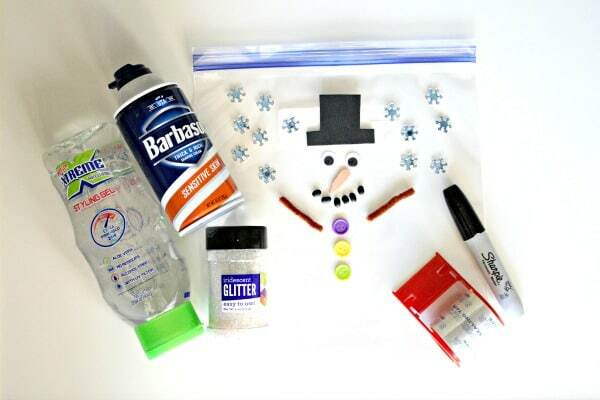 Naturally, with the change in seasons and our current winter themed learning activities, it only seems fitting to make a snowman squish bag. To establish some background knowledge about snowmen, we first read All You Need for a Snowman by Alice Schertle. She happens to be one of our favorite authors as we adore her Little Blue Truck series, and this snowman book remains a classic as well with its rhythmic text that keeps you turning the page to learn more about what you need for a snowman. 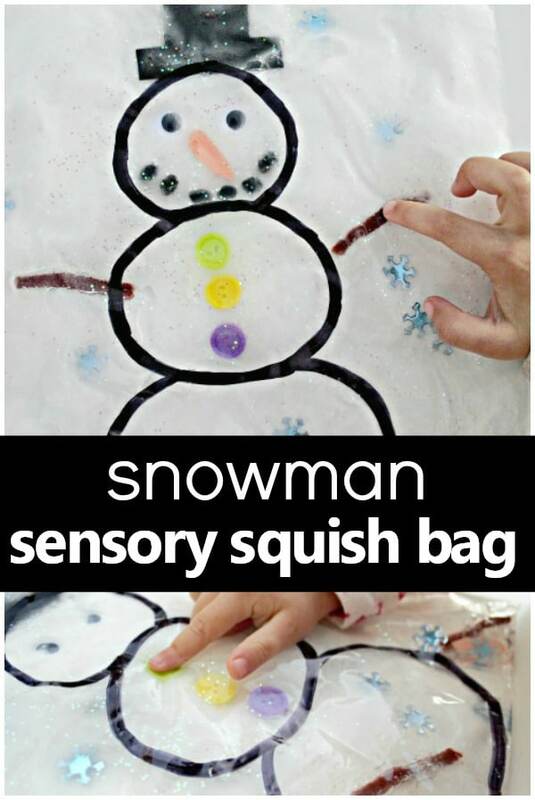 As an extension to the text, we created our snowman sensory squish bag. 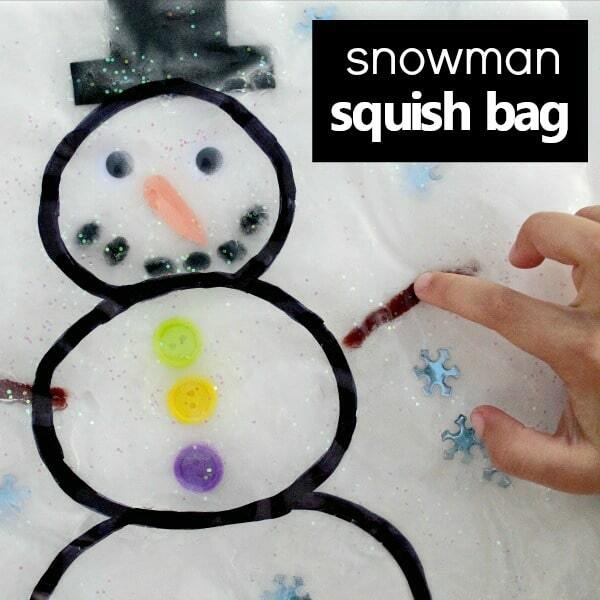 This wintry squish bag provides quiet hands-on sensory play all while staying clean. It’s a win-win! 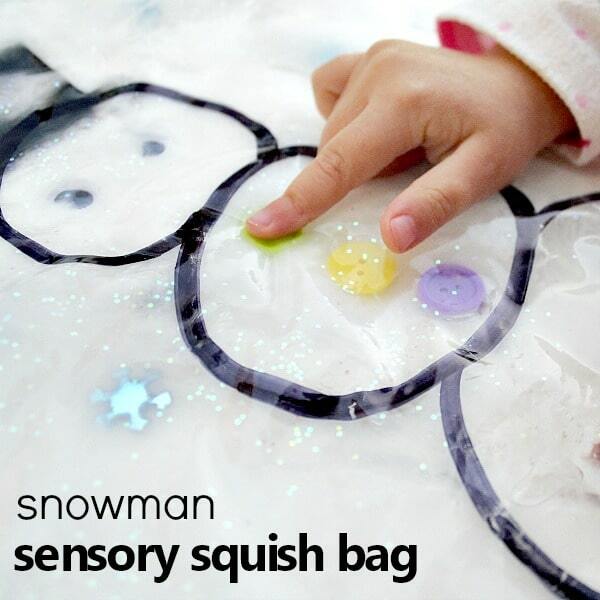 To set up this sensory squish bag, I first drew the outline of a snowman onto a piece of paper and then used it as a guide to trace it onto a gallon sized Ziplock bag. I found this method to be helpful in preventing permanent mishaps on the Ziplock. When possible, I like to include children in creating their learning and play materials. By helping to assemble this snowman squish bag, we were able to discuss the parts of a snowman and lots of vocabulary along the way! It also gave us a chance to reflect on the preview text. First, the girls dropped in all of the loose parts that we would need to build our snowman and play with a wintry scene. They included two googly eyes, three buttons, five black “coal” beans, an orange “carrot” nose cut out of foam, a black top hat made of foam, and two brown pipe cleaner pieces for the arms. *Update* After some use, the black beans began to bleed their color throughout the squish bag. We recommend using small black pom poms or buttons as a substitute. We also added some sparkly snowflake jewels that we found at our local dollar store. 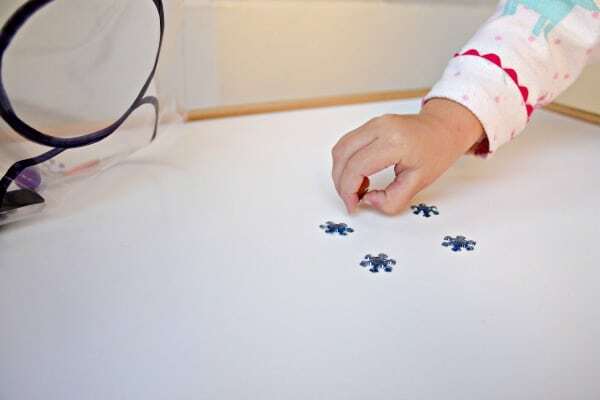 My toddler got some extra fine motor practice as she flexed those pincers to pick up each snowflake! Next, we squirted the clear hair gel into the sensory bag. Once assembled, the hair gel provides fluidity for the objects to be pushed around. For a little bit of snowy color, we added just a few squirts of a white foamy shaving cream. 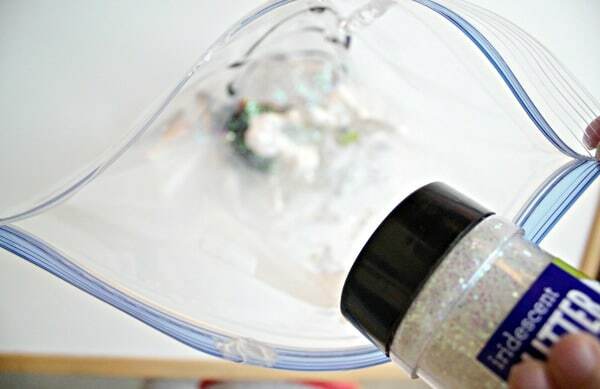 Of course, we also had to add a little sparkle, so glitter was a must (although optional). They were eager to seal up the bag and begin exploring! As an added precaution for any of the wet ingredients leaking out of the bags, I added some clear packing tape around the edges of the bag. When doing these types of sensory bags in the past, I have found that this prevents the edges from popping open and keeps the sensory discovery and play much cleaner! The girls loved the squishing feeling under their fingers as they carefully slid each part of the snowman into its proper place. “Building” the snowman proved to provide lots of fun and learning! This squish bag gave my toddler lots of practice in identifying and naming colors and even shapes. I would ask her to find the yellow button, or something orange or black. Once she recognized the color, she would excitedly poke and squish. 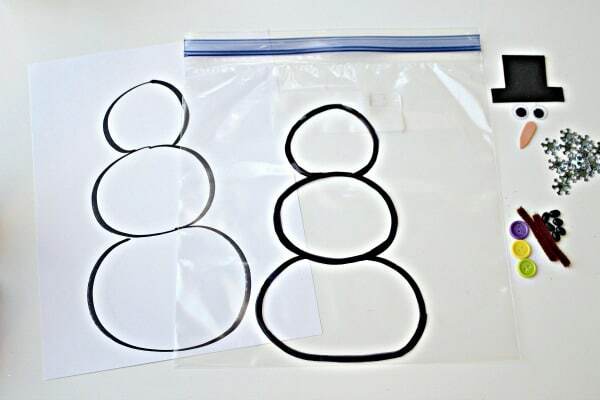 We also worked on one-to-one correspondence by counting the number of buttons on the snowman. My kindergartner made comparisons using words such as more than or fewer as she counted the number of blue snowflakes and black “coal” beans on the mouth. 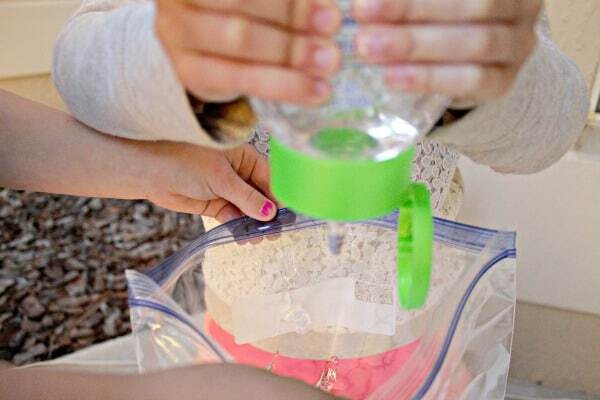 I love to use our sensory squish bag when I need to occupy little hands at a restaurant, waiting room, or in those few minutes before dinner is ready. 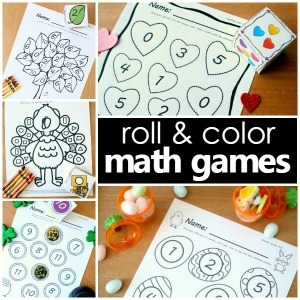 They also make a great activity for busy hands to play with as you read your favorite books about snow or winter. 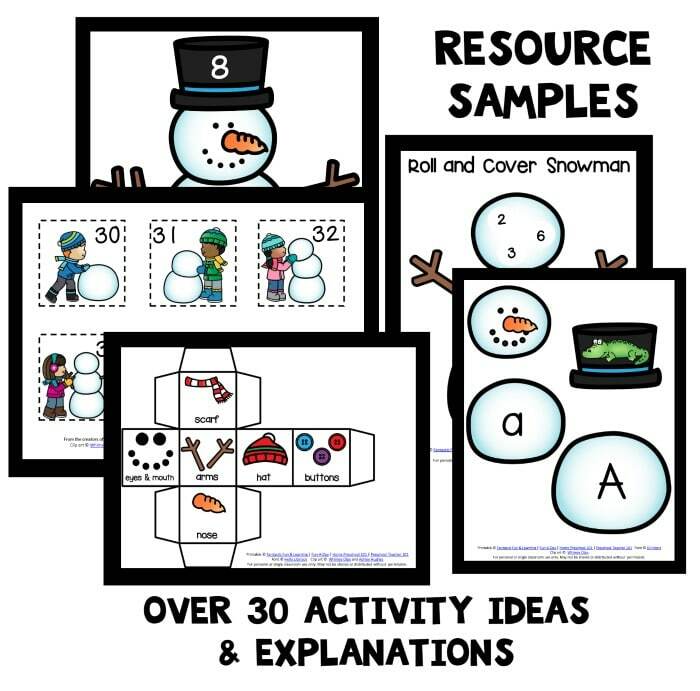 I plan to leave the snowman squish bag out for the girls to explore as we dive further into our winter themed learning activities. 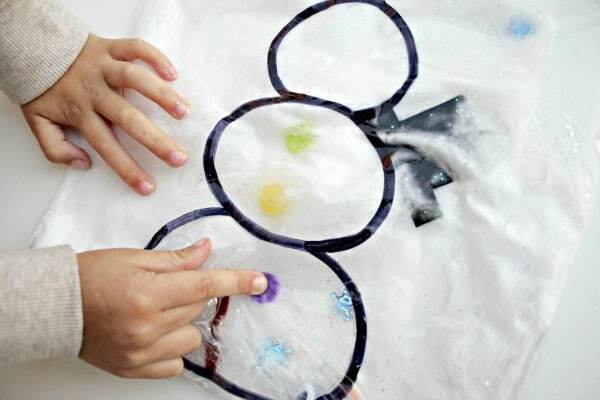 We hope you enjoy making this sensory squish bag too! 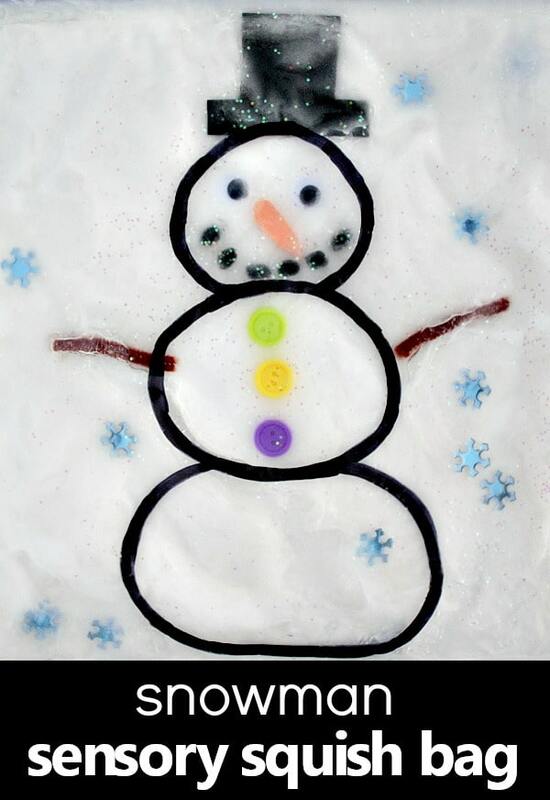 For another variation of this idea check out the Jumbled Snowman Sensory Bag on Playground Parkbench. 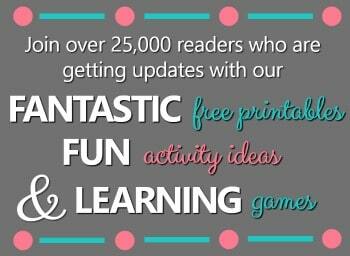 What are some fun and hands-on ways you like to encourage theme based learning?